Picture this: You wake up feeling refreshed and revitalized after the most dreamy night’s sleep in your plush over-water villa. You take a few steps out onto your spacious private decking area, and soak up the wonderful views of the shimmering blue lagoon. Breakfast is quite the affair, as you feast on exotic fruits, superfood smoothies, freshly baked goods and Maldivian delights, before taking a stroll on the soft white sands. You spend the day snorkeling and lounging beach-side, before enjoying a romantic dinner for two under the starry skies. This isn’t a dream, this is what you can expect every single day with a stay at the Meeru Island Resort. Perhaps the Maldives have been on your holiday wish list for a while now, but you have been putting it off for because of the sky-high room rates. If so, the Meeru Island Resort offers an incredible tropical island getaway for a fraction of the cost of many of the other resorts. In fact, you may have to do a double take when you see just how little it costs per person and night. So what exactly does a stay at this resort get you? And do the past guests approve? Read on for everything you need to know before you book a stay at Meeru Island Resort. Meeru Resort is located on Meerufenfushi Island, which is approximately 45 km from Mali airport. From there, you’ll need to get a speedboat directly to the island which takes around 50 minutes. This is a great option for those who don’t like the flying in tiny planes. Plus speedboat transfers cost a lot less than seaplane transfers. Staff at the Meeru Island Resort will be able to arrange all your transfers for you based on your arrival and departure times. There are 5 different room types to choose from, and they are: garden rooms, beach villas, jacuzzi beach villas, waterfront villas and jacuzzi water villas. If you’re looking for the most wallet-friendly room then we suggest you go for the recently renovated garden rooms. There are 22 garden rooms available, and a bonus is they are just walk a few steps away from the Dhoni Bar freshwater pool. All garden rooms come with an indoor bathroom and rainshower, mini bar, complimentary tea and coffee, a large flat screen TV, a safe, air conditioning, and fluffy bathrobes. The decor is a little different from that found in many other Maldives resorts – it’s bright and modern, with an ocean blue theme to complement the azure waters. If you still fancy a stay onland, but perhaps want a little extra space and privacy as well as a partially open-air bathroom and Jacuzzi then go for the special jacuzzi beach villa. These villas are located on a quieter stretch of beach, and feature a large decking area complete with tropical plants, parasol, and comfy sun loungers. They also come with all the amenities you have in the garden room, with the addition of a linen-lined four poster bed, plush cushions, and beautiful finishing touches such as artwork and Maldivian decor. But the true gem in Meeru Island Resort’s Crown Jewels is the jacuzzi over water villa which is located on a private jetty, away from the busier side of the island. All over water villas feature floor to ceiling glass doors which open out to the beautiful lagoon, as well as an outdoor private decking area with a Jacuzzi so you can relax in a bubbling hot tub under the stars. There are also steps leading straight down from the Jacuzzi decking into the marine life-filled waters. The resort also has several other room types – so there’s something for all tastes and budgets. Click here to check out the different rooms available and see the latest deals on rates at the Meeru Island Resort. 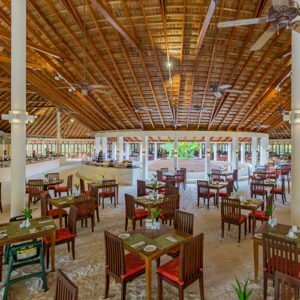 Dining is an absolute delight on the Meeru Island Resort, and there so many world cuisines to choose from, you’ll never have to have the same thing twice. A favourite is the Asian Wok House, which is set on stilts over the lagoon. There you can find fresh and exciting Asian inspired cuisine, including grilled fish and noodle dishes. There are two main buffet restaurants located on the island, both of which offer generous buffet breakfasts, lunches and dinners for all guests. 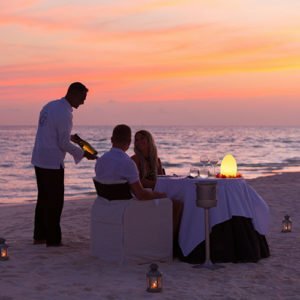 Both also offer casual dining under a traditional thatched with white sand beneath your feet. The buffet offerings change daily, and the chefs like to incorporate different world cuisines and theme nights to spice things up (sometimes literally)! Chefs here are very accommodating, and there are always plenty of options for vegetarians and vegans. Friday night dinner is a special Maldivian theme night with a delicious local menu and waiters in traditional dress. There is also their version of a Sunday Funday – and that is free sparkling wine served at breakfast. If you have a special dietary request, be sure to let the helpful staff know when you arrive and they will be more than happy to offer advice on the top places to dine at, and the best dishes to choose. If you love to enjoy a tipple my then Meeru Island Resort impresses with no less than six stylish bars. Arguably the prettiest of the lot has to be the Dhoni Bar, which overlooks the jetty and the fleet of yachts. The resort states that this bar the most popular meeting place on the island. It has a huge range of alcoholic drinks, wines and champagnes on offer, and the bar staff also able to craft fresh and fruity mocktails if you don’t drink. A bonus is that the Dhoni Bar is open 24 hours a day, 7 days a week. For fun times in electric atmosphere, head over to the buzzing bar that is located opposite the main reception. This fun hangout spot is home to a range of games, including darts, chess board game, football and even table tennis. A section of the bar has been turned into a sports area where you can watch the latest games. There’s also a live music stage, special events program and an evening disco. If you don’t feel like dancing, then the outdoor seating and wooden decking area provide a place to people watch. Spa-lovers are in for a real treat at the Duniye Spa, which offers a huge selection so of pampering treatments and packages. 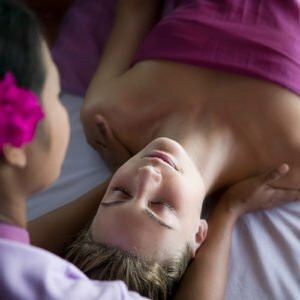 If you’re travelling with someone special, then we recommend the full moon magic package which includes a full body massage, body polish, Indian head and foot massage, tropical bath infusion, mini facial, as well as a fresh fruit platter and a glass of bubbly. The Spa also offers a range of treat beauty treatments including luxury manicures and pedicures, as well as a healing hands treatment known as reiki. If you want to give your hair a little more shine then we recommend the coconut oil massage, which includes a rosemary infusion for glossy locks. 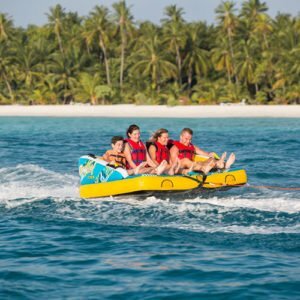 You can tell the Meeru Island Resort has put a lot of effort into designing a very extensive activity and excursions program to keep guests of all ages entertained. 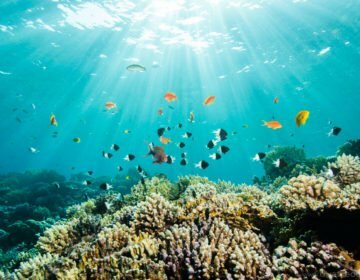 If you love to explore the underwater world then book a guided snorkeling trip, or simply hire a snorkel and explore the shallow house reefs yourself. 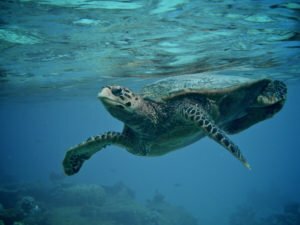 Waters are filled with tropical fish, manta rays, and turtles, and you may even see a friendly shark or two if you’re lucky! If you want to get up close with the beautiful marine creatures, then you can go scuba diving. Meeru Island Resort offers the whole range of PADI certified courses, from beginner right up to divemaster, as well as specialty courses too. There are three separate classrooms that are completely air conditioned and equipped with TVs, and PADI course materials are available in all main languages. Every day the dive centre offer up to 8 different excursions to the best hotspots around the islan. The daily regular schedule includes morning dives, afternoon dives, night dives as well as two tank trips. If you prefer to stay on dry land then you’re in luck. Meeru Island Resort has tons of land sports to choose from. There are tennis courts that are available for both daytime and night-time use, a golf course complete with driving range putting green and 9-hole green, a badminton court, a 24-hour Fitness Centre, beach volleyball, table tennis, billiards, darts, a football field, freshwater swimming pools as well as a kids pool. It’s worth noting that all equipment hire is available in the all inclusive plus package, otherwise it costs $10 to hire your sports equipment. And of course you can incorporate your love for the water with your love for sports by choosing to try out some water sports. The Meeru Island Resort has a huge selection of water sport activities on offer – which you can find out more about at their centre which is operated by Euro Divers. At the water sports centre you can hire stand-up paddle boards to take out on ocean (or even try SUP yoga), you can sign up for hair-raising tube rides, book a catamaran trip and explore the Island at sunset. Head out on a kayak, or even hire a glass bottom boat that comes and a knowledgeable captain who will take you to the best spots to view the marine life and colorful corals. 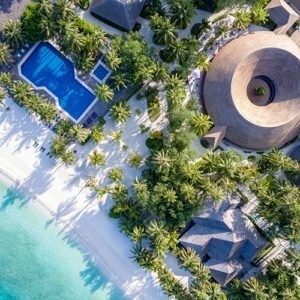 Despite there being so much to choose from, remember that the Maldives are often less about doing and more about simply being. One of the best things about spending a week or two on this paradise island is that you really get the chance to unwind away from your busy schedule back home. Here it’s perfectly acceptable to simply lounge on the beach or read a book under a palm tree – for hours. Meeru Island Resort isn’t pretentious in any way, in fact it’s quite the opposite. They promote a very laid-back casual vibe, where is okay to wander around barefoot in almost all areas. We haven’t actually mentioned the price yet, this is because it does change a lot from low to high season, so it’s worth checking it out for your dates by clicking here. However, whenever you choose to visit you can rest assured the Meeru Island Resort has very low rates compared to most of the other Maldives Resorts of the same caliber. In fact, a weekday here can often cost average of a one night stay in another Maldives resort! There are a few downsides, the decor in some of the cheaper beach rooms is not quite up to scratch (and leaves a little to be desired despite being recently renovated), and the indoor bathroom lacks the magic of an outdoor shower. But overall, Meeru Island Resort gets rave reviews from past guests, particularly when it comes to the food, the service as well as being great value. It’s an excellent option for families, as the resort is very kid friendly, but also they have separate adult-only section so you can find peace and quiet away from them when you need it. If you are looking for a great value tropical better way than you really can’t go wrong with the Meeru Island Resort. Click here for the latest rates and to book your stay. Need a little extra help with your Maldives planning? 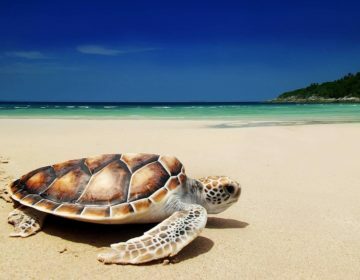 Check out this article for the best time to visit the Maldives, and click here for everything you need to know before you go. Happy Travels!